A delicacy by it's self or serve with crackers and cheese. Must be refrigerated upon receipt as stated on the label. Red Hots to hot for you? Try these. 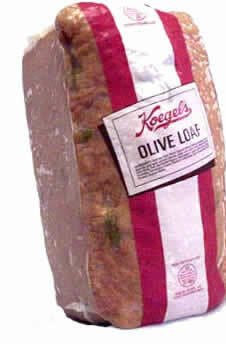 Fully cooked in natural casing. May be served hot or cold. 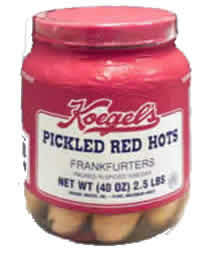 Koegels Pickled Bologna and Red Hots are old time favorites of families from Michigan and elsewhere. Slice and serve with crackers, cheese or just by itself. 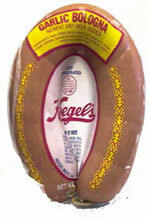 The special blend of beef, pork and spices makes Koegels Pickled Bologna an excellent choice. 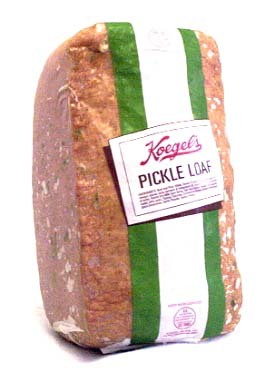 For the milder palette, Koegels Pickled Bologna is excellent. 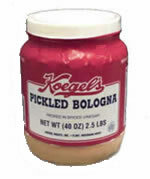 Pickled Bologna makes a wonderful party tray relish. Simply cut into slices and present with toothpicks or stick each one for a festive looking porcupine tray. Cubed cheese on the side is always a nice compliment. 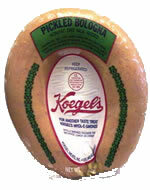 Koegels Pickled Bologna is Ring Bologna packed in vinegar and special spices. Red Hot Pickled Frankfurters have hot peppers in the pickling juice and also in the meat itself. Try the Red Hots for that extra kick. All items direct from Michigan.